“It’s so fluffy I’m gonna die!” Six of the most quotable words squealed by one of the cutest fictional kids ever to prance onto the big screen. For those of you who haven’t seen Despicable Me, get off of this computer right now and zoom to the nearest modern-day-version of Blockbuster! (Ahh, the good old days) And for those of you who HAVE seen Despicable Me, you will understand why Agnes is one of the best cartoon children ever created, and you won’t think me crazy for wishing that when I have kids someday, I will have my own miniature Agnes for a daughter. Considering how much I love this movie and this character, choosing to become her for this Halloween was quite the easy decision. I wasn’t anticipating much trouble in putting together her costume, but I did want to make sure it was perfect, and as close of a replica as I could get. I have always been highly dedicated to dressing up, costumes, and spirit days in high school (does it surprise you that I majored in musical theater in college?) 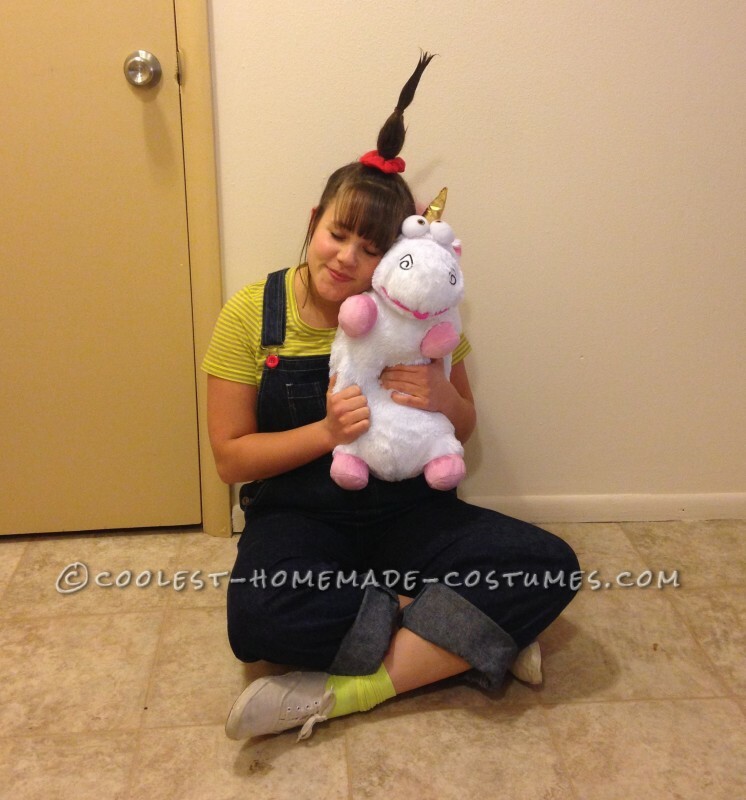 So my costume-assembly was more about the gathering of each perfect individual item to truly become Agnes. First step, the unicorn—OBVIOUSLY. Without a unicorn, I would have just become another plain (if not incredibly cute) little girl. 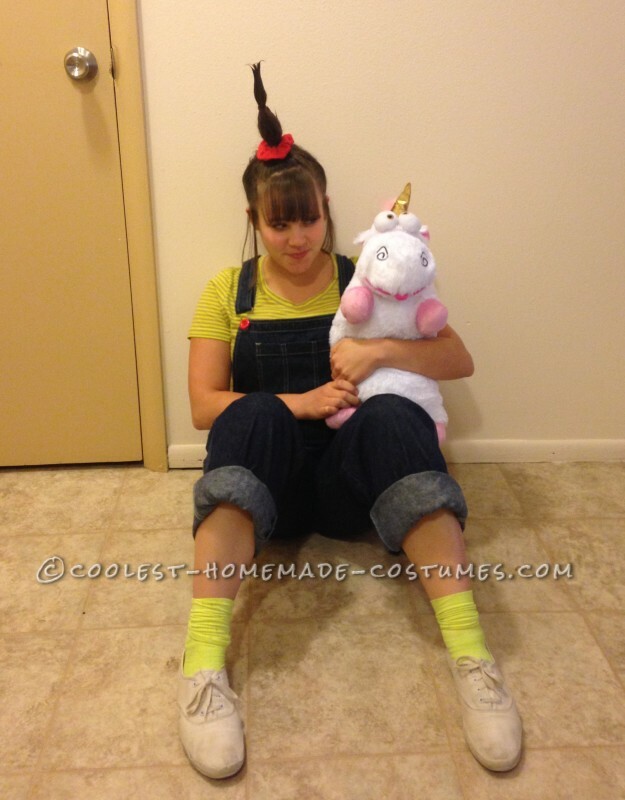 Agnes NEEDS a unicorn to truly be Agnes. 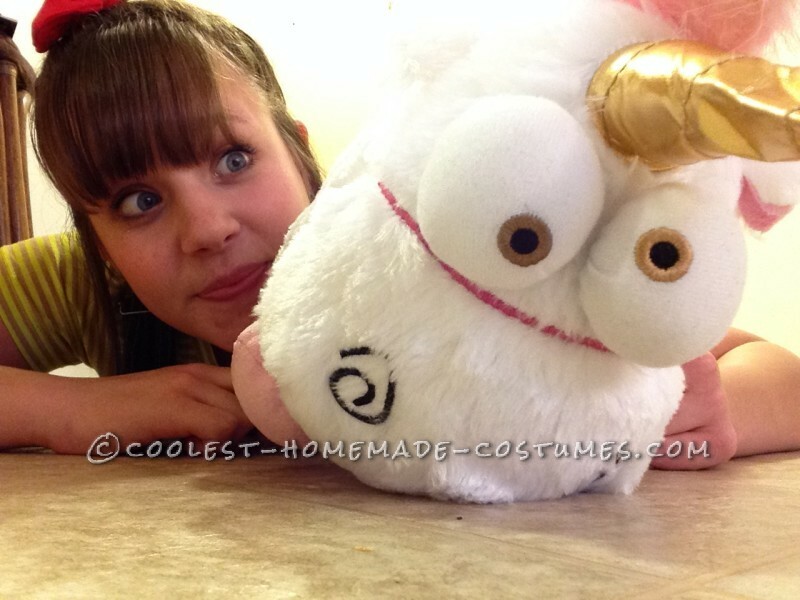 I ordered an authentic Despicable Me unicorn offline (TOTALLY worth the money, and it is now the perfect cuddle companion while I sleep—shh, don’t tell). Next I went to Goodwill to search for overalls and a yellow shirt with brown stripes. No luck with the overalls, but my awesome boyfriend found the perfect shirt; almost an exact match to the one Agnes wears in the film. I was dancing with joy and triumph! Then, yadda yadda yadda, long story short, I spent the next TWO days searching for overalls (and overalls that actually fit—specifically for someone with hips and a rear end), which totaled to over 6 ½ hours of driving around in desperation. But finally, Ragstock was my saving grace, and I found my overalls (thanks to a bit of tweeted advice from my friend). Amid all of the hours of driving, I had also obtained the crucial red scrunchie and the red buttons for the overalls. I already had the white shoes, and cut off the ends of a yellow pair of leggings I already had to make the yellow socks. Thus, with all of my items collected and ready, I awoke on the morning of Halloween with glee in my heart, ready to skip off to work with a unicorn in my arms and my Agnes-hair standing tall. That part was fun. I actually used my eyeliner tube as a base for my upstanding hair. I placed it on the top of my head and gathered all my hair around it, securing it at the bottom with a hairband. I then proceeded to use gallons of hairspray and gel (and another little ponytail holder) to make my hair stand proud. Oh, and about 36 million bobby pins. I also pulled out the two strands of hair just above the top of my ears to further replicate Agnes’ adorable hairdo. It was beyond worth it. My hair was standing straight up, accenting with the vital red scrunchie, my bangs falling across my forehead, and my two little coifs falling down the side of my face, all just like Agnes. 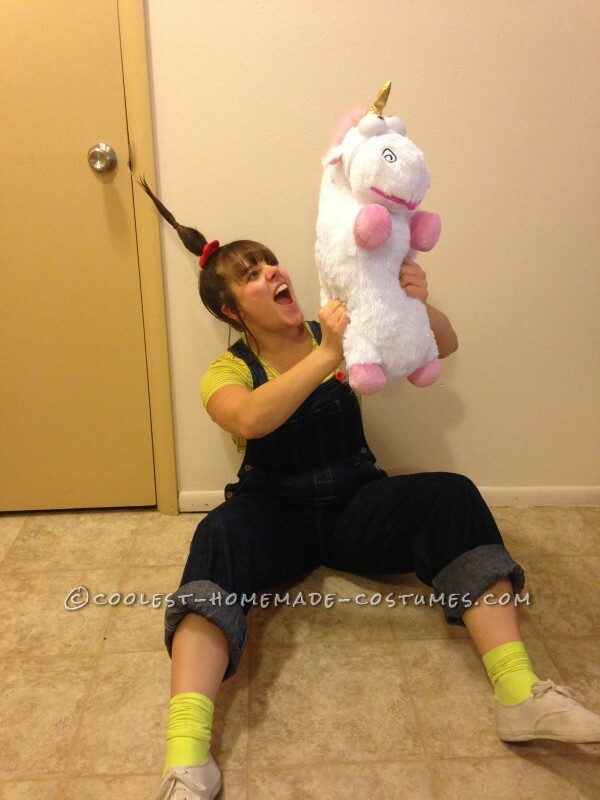 I then dressed myself in her outfit, grabbed my unicorn, and pranced out the door with joy in my skip. I truly could not have been more pleased to find that everyone at work LOVED my costume. I work as a receptionist at a college, and the desk I work behind is rather tall, so quite often I would be approached with outbursts of giggles from students, as the only thing they could see above the desk was my hair sticking straight up. 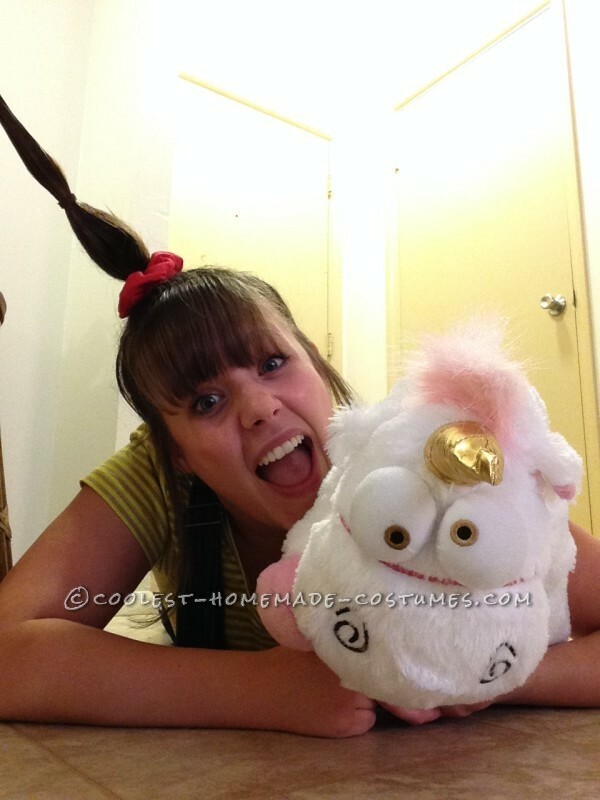 A few people asked if I was Cindy Loo Who (I understood the confusion) but as soon as I uttered the words “Despicable Me” and held up my unicorn, their eyes would widen, smiles brighten, with proclamations of understanding and bursts of laughter! Others knew who I was right away and were equally as delighted. People wanted to take pictures with me, show me to their kids at daycare, and hear me say “It’s so fluffy I’m gonna die!” (Which I was more than willing to do. Have I expressed how much I love Agnes enough yet?) I even won first place in a costume contest for the “Most Original” category! I also received many glowing and awesome comments when I posted my picture on Facebook. One of my friends said I made him cry, and another posted “This should be on Buzzfeed.” I honestly was just so incredibly happy to have brightened so many people’s days, sprinkling each of them with a little joyous magical unicorn-dust. Overall, this is one of my favorite Halloween costumes I have ever done. I felt that it was original but also relate-able/recognizable, the replication was spot-on, the dedication to my character was thorough, and it was FUN! We all have a 5-year old child in our hearts, waiting to burst forth with silly songs, untainted laughter, and a sense of imagination as big as the expanse of the cosmos. Halloween was a chance for me to access that even more than I normally do (and I do it quite a lot, no shame). I hope that I have brought some uplifting joy (and maybe even some giggles) to your day, and that you go out and do something wildly silly without any inhibitions! 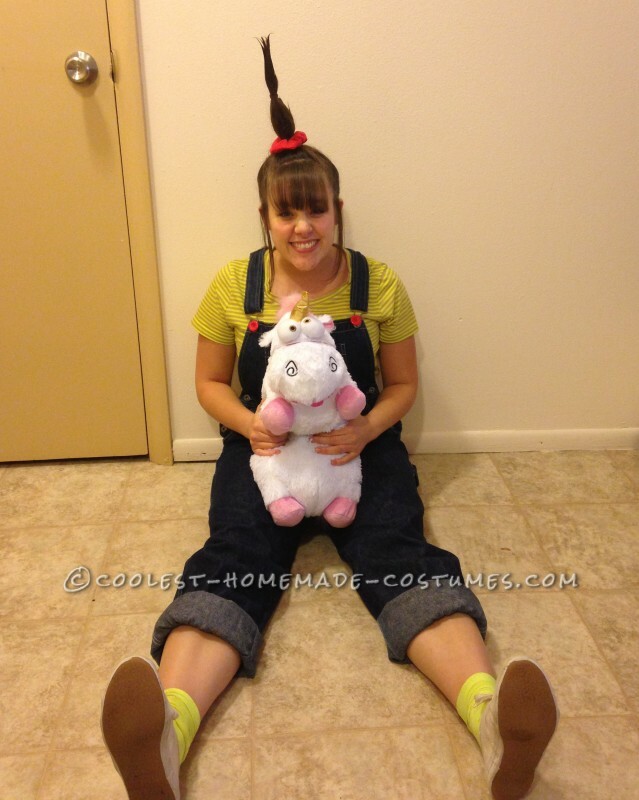 Go release your inner Agnes for a day, and bathe in all the unicorn-goodness that is waiting for you in the world. Coolest DIY Breakfast Family Costume With Our Dog!